To build up some content on the site, I'm going to be posting a few of my past projects that were kind of like milestones in my development as a sculptor. I'll call them "Old Strains," and you can feel free to check them out if you're curious. 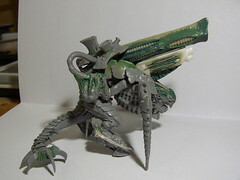 In 2006, I got a hold of the plastic carnifex kit for the first time, and immediately set to work tearing it appart and attempting to build it up into something more. 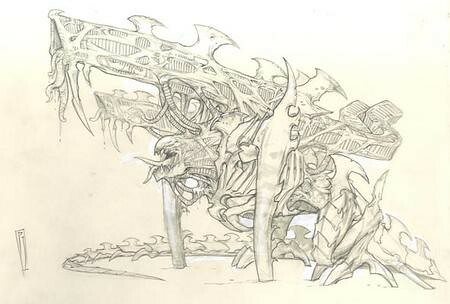 I was, once again, inspired by a fantastic concept sketch for a Biovore (this time by the phenomenally talented Roberto Cirillo) that had gone unrealized in the rather underwhelming resculpted Biovore model. Though it was a sketch for a Biovore, I thought I'd be able to do it a bit more justice if I upped the scale somewhat to Carnifex-size. 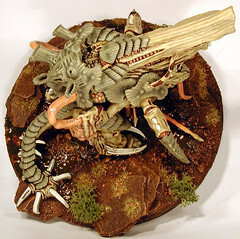 I also thought this might be a good opportunity to start in on a completely separate idea I'd had for some time: starting in on re-imaginings of the classic Tyranid Epic-scale beasts. I wanted to give them actual legs, bodies, and a imposing presence on the battlefield (hence why I labeled the idea the "De-Sluggification" initiative), and I thought that, perhaps, the plastic carnifex kit was the best backbone for the project. 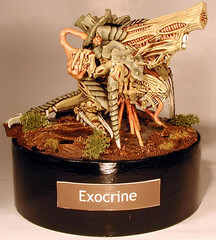 Thus was the Exocrine born. 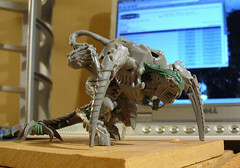 I wasn't going to strictly adhere to the Cirillo sketch, allowing, instead, the wonderful plastic carnifex kit to be my primary guide in the conversion, but I still wanted to keep key elements of the concept, like the use of scything talons and tail-mounted claws to dig in and brace the beast when it is about to fire it's massive bio-cannon. There was also the unique head and all of that gribbly cabling I wanted to carry over, and, of course, the idea of a back-mounted cannon. It was my first time trying to build up a Bio-cannon from scratch (using plasticard, greenstuff, and guitar wire), and yet it came out better than some of my subsequent attempts at doing just the same thing. 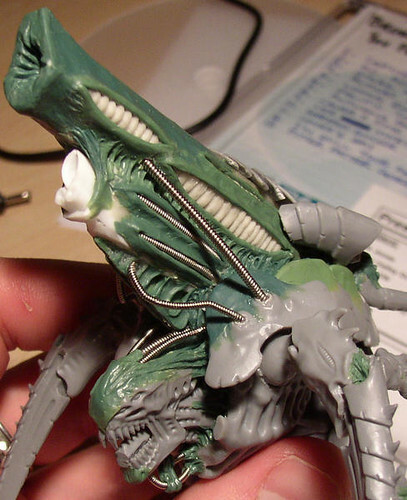 I'm pretty sure this was the first time I ever used guitar wire, but I discovered that it works just as well as Tyranid bio-cabling as it does as cabling for technology-based models. Big thanks go out to Moloch for taking the time to put his brush to something I created. 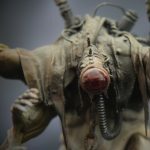 He seemed to be sold on my concept for the model from the get-go, and, as odd as it may sound, I think I only realized how well the model had turned out after I'd seen how Moloch has managed to showcase the beauty he saw in it through paint. Ze Mighty Moloch has always been a huge cheerleader of mine, often seeing potential where I was blind to it. 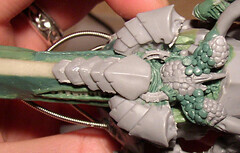 He, and later Hydra, have been a huge factor in keeping me interested and involved in this hobby. I love the crazy, buggy things we can come up with when the three of us work together, and I value the way that we all try very hard to keep each other motivated and creating. 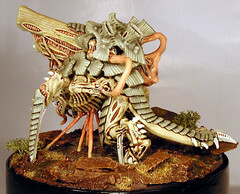 If you've never heard of Moloch or Hydra, you owe them both a look as they are two of the best Tyranid artists out there.